Brother Lamark, Aenid, Xanthia, and Calpurnia head up into the hills, a three-hour trek. They chat along the way, and discover that Brother Lamark is from the same hive as Aenid on Scintilla; he served in the Imperial Guard before he met Abbot Skae and followed himin his ministry. He is interested in learning about the Inquisitorial assistants and seems tireless and vigilant. He speaks of the peace he has found here, trying to bring the light of the Imperium to the tribes. Meanwhile, Rollando and Aristarchus investigate in Stern Hope and question the locals. Most of the inhabitants are refugees from the tribes, who are very weary of constant strife and hope that the Imperium will move in to protect them now that the cathedral is built. The investigators also hear about one warlord, Seth the Voice, who claims to speak to the Emperor. He is nominally pro-Imperium, but his followers are crazed, even by Iocanthos standards. Abbot Skae and Seth the Voice do not have a very good relationship, as Seth sees the abbot as a competitor. 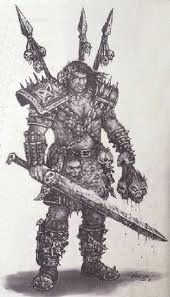 Warchief Kos'ke, on the other hand, is a distant relative of Warlord Skull and one of his followers; he is looking to become the protector of Stern Hope. They investigate the area, and Calpurnia finds another marking of St. Drusus' 2nd Army Group freshly burned into a rock face, less than an hour ago — but no tracks near it whatsoever. She then finds the tracks of the hexalid, who arrived here at a hard run, bits of flesh falling off. Calpurnia can tell that he came from the direction away from Stern Hope, but following the tracks would make it difficult to return into town before the celebrations start. They return to Stern Hope; Aenid and Calpurnia are fatigued. They meet back with Aristarchus and Rollando and exchange information. Aristarchus takes care of Calpurnia's wound, but takes Rollando aside and asks him to keep an eye on Calpurnia for signs of infection by the Ruinous Powers. Everyone gets a bit of rest before dusk. At dinner time, Kos'ke and five of his men arrive, mounted on dustdogs. In the middle of their group is a cloaked figure, and the townies whisper that this is the Deathsinger. They head for the warriors' camp. Calpurnia stays at the guest house to guard Aristarchus, while Rollando, Xanthia, and Aenid go try to meet with Kos'ke. The Warchief wants to speak with them as well, so they are introduced. Kos'ke greets them warmly, gives a knife to Aenid as senior officer, a present in the name the Emperor, and Aenid gives him hers in thanks. He also gives them furs and pelts for Aristarchus. He speaks of Seth the Voice with dislike, and he recommends that they speak to Deathsinger Esha Raine about the unnatural goings-on. They drop the furs off at the guest house, ask Brother Lamark to guard Aristarchus, and Calpurnia accompanies her companions to see the Deathsinger. They speak to her of the undead creatures they have seen, and of the Dancer in the Dark, and she becomes very somber. She says she must Sing the Old Songs to find any information that could help them. Next, they go to inspect the cathedral. First, they examine the outside; then they decide that Aenid and Xanthia will once again go in discreetly while Rollando and Calpurnia will distract the two guards posted at the door. But when Rollando walks up to the guards and asks to go in, they are entirely willing to let him through, as a representative of the Emperor. Commissar Jemadar immediately bristles at this breech of regulations, and questions the men on their orders; they admit that the abbot has instructed them to let no one but himself, Brother Lamark, and Brother Severus through. Calpurnia heads to the priory to report this to the abbot, while Rollando berates the guards; all this provides plenty of distraction to allow Xanthia and Aenid inside and let them ascertain that there is no trace of sabotage or infiltrators. The four finally go to bed to a get some rest for the big day ahead. But Xanthia is awakened by Cherubiel in the middle of the night; he tells her he knows about the Dancer in the Dark — the enemy defeated by St. Drusus, but not destroyed. He tells Xanthia that he hates to give her up, and that she will miss him compared to what is coming for her and her companions… The Dancer in the Dark is coming, Cherubiel claims before he vanishes. Xanthia awakens to find everyone staring at her, as she ranted her half of the conversation aloud.